With Gardener’s Choice Bark Mulch. The control of weeds in new and existing gardens is a perennial problem. Traditionally weed control was by either chemicals or weeding by hand. Weeding by hand is slow and tedious and the practice creates an ideal environment for the germination of a new crop of weeds. It is necessary to weed several times a year to keep the soil fresh and clean. This work is likely to disturb plant growth. Chemicals also create problems. They are hazardous to one’s health and the final appearence after the treatment is seldom satisfactory. Gardener’s Choice Bark Mulch overcomes all these difficulties and is the ideal and best solution to weed control. Used to a depth of 3″(7.5cm), it will keep your garden weed free for up to 3 years. During this time your garden is beautifully weed free. Weeds compete with your plants above and below ground level. Sunlight, soil nutrients and moisture are in scarce supply and weeds are hungry for these resources. The elimination of competition from weeds gives your plants the oppourtunity to thrive. The performance of your plants will be noticeably better as soon as you start using Gardeners’s Choice Bark Mulch. 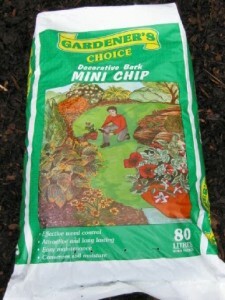 Gardeners Choice Bark Mulch is a natural soil conditioner and all soils benefit from it’s use. Clays are improved better aeration and drainage, loams have their fertility levels increased and sandy soils become less liable to leaching and drought. Bark mulch is totally organic and is fully incorporated into the soil. Gardener’s Choice Bark Mulch is clean, simple and safe to use. It will have your garden looking good all year round and give your plants year round protection from frost and drought. Gardener’s Choice Bark Mulch offers you a high quality, premium product that is safe and simple to use. Now used on the most prestigious projects and stately homes it will greatly add to the beauty of your garden. For best results and total weed control cover the soil completely.